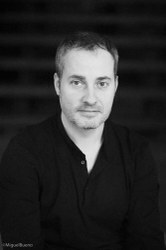 Editor’s Note: This is the first in a series of three posts analyzing the landmark December 2015 Paris Agreement, authored by Professor Jorge Viñuales, the Harold Samuel Professor of Law and Environmental Policy at the University of Cambridge Faculty of Law and the Director of the Cambridge Centre for Environment, Energy, and Natural Resource Governance (C-EENRG). Less is more, at least sometimes. The 21st Conference of the Parties to the United Nations Framework Convention on Climate Change (‘UNFCCC’) resulted – against all odds – in the adoption of a ‘Paris Agreement’ (hereafter, “Decision”) which will be opened for signature on the 22 April 2016. (The Paris Agreement is appended as the Annex to the Decision.) The Paris Agreement is not perfect, but is more than many of those who have followed the climate negotiations over the years realistically expected. My purpose here is not to provide a comprehensive analysis of this instrument. That will come in time, once the new Ad Hoc Working Group on the Paris Agreement (‘APA’) but also a number of other Party and ‘non-Party stakeholders’ (Decision, paras. 134-137). have provided further details as to both the modalities of the different mechanisms introduced by the Agreement and the variety of nationally determined contributions and other actions pledged in connection with mitigation and adaptation. However, from the perspective of a lawyer and addressing an audience of lawyers, I thought it would not be without interest to provide an annotated snapshot of the legal architecture of the Paris Agreement. Part I of these posts focus on the context that led to the adoption of the Paris Agreement and provides an original schematic of the Paris Agreement and the goals of the Paris Agreement. Part II tomorrow will set out the three main components of the Paris Agreement’s architecture and offers concluding observations. Finally, Part III will discuss the implementation techniques of the Agreement and offer concluding observations. It was very courageous for France to take on the organisation of COP-21 after the diplomatic (but not sociological) failure of COP-15 in Copenhagen. Over the years, and particularly after the 1997 Kyoto Protocol turned the UNFCCC distinction between Annex I and non-Annex I countries into what some have called a ‘Chinese wall’, the main challenge facing the climate change regime has been to bring back major developing countries (China, India, Brazil, South Africa, Indonesia, Korea, Mexico and others) under some form of emission reduction commitments comparable to those applicable to developed countries. Indeed, such non-Annex I countries have no quantified emission-reduction obligations under the Kyoto Protocol and that, in turn, rendered politically difficult for developed countries, and particularly the United States, to enter the bargain. The result was that, as of today, the commitments under the Kyoto Protocol cover not more than 14% of global annual emissions, whereas the main emitters, including China and the United States, which account together for almost half of global annual emissions, were not bound by any clear commitments. A first attempt to address this issue was made in 2007 at the Bali COP, which launched a negotiation process that was supposed to lead to the adoption of a new instrument in Copenhagen, at COP-15 (2009). This process, entrusted to an Ad Hoc Working Group on Long-term Cooperative Action (‘AWG-LCA’) was unsuccessful in its end result and came to an end shortly after the 2011 Durban COP, when the negotiation mandate that led to the new Paris Agreement was launched. However, several steps made under the AWG-LCA, including the unloved Copenhagen Accord and the subsequent Cancun Agreements, were very influential in shaping the Paris Agreement. All in all, an observer joining the conversation today would mainly need to know that in December 2011, the COP-17 held in Durban adopted the ‘Durban Platform for Enhanced Action’ (‘ADP’) which was expected to lead to a ‘protocol, another legal instrument or an agreed outcome with legal force’ ‘applicable to all’ by 2015 at the Paris COP-21. And the ADP did deliver, as discussed next. 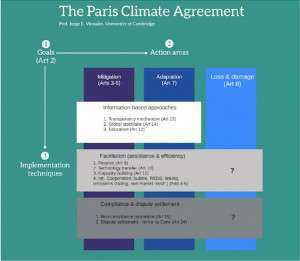 The Paris Agreement has three main components and each of them is a composite array of provisions in the Agreement itself and external related materials that must be understood, technically, as the context of the Agreement in the meaning of Article 31 of the Vienna Convention on the Law of Treaties (‘VCLT’). Before analysing these components, it must be noted that there is much that cannot be captured in a schematic presentation of the Paris Agreement. From the very preamble of the Agreement, one finds in a condensed manner carefully crafted expressions of the main tensions underpinning the entire text, between developed and developing countries, between more vulnerable countries and the rest, between countries that expect to suffer from measures that ‘respond’ to climate change and the rest, between climate change action and human and collective rights, particularly as regards the fight against poverty (as a paramount objective) and the need for a smooth transition of the work force, between intervention in and conservation of nature, and between science and equity. Some elements of these underpinning tensions will feature in the following analysis, but they would deserve far more detailed treatment. Article 2 of the Paris Agreement sets three goals within the broader objective of Article 2 of the UNFCCC. Most of the attention tended to focus on the figures and, more specifically, on whether limiting the increase in global average temperature to 2 °C is insufficient for some countries and, more specifically, whether a target of a 1.5 °C increase would be more appropriate. Behind this discussion lies a tension between science and equity. From an equity perspective it seems clear that 1.5 °C would be preferable, but such a target would have complex signalling effects because, scientifically, it looks extremely difficult to achieve (See C. Carraro, E. Massetti, ‘The Improbable 2 °C Global Warming Target’, in Vox, 3 September 2009) and, perhaps unrealistic. Selecting it as the only target could have placed the entire Agreement under a different – mostly aspirational – light rather than as a truly regulatory instrument. If the Agreement was meant to send a clear signal to producers and consumers as to the need to shift from a fossil-fuel based economy to a decarbonised one (although the term carbon neutrality was in the end not mentioned), both targets had to feature. That was the solution eventually reached, with Article 2(1)(a) stating that the objective is to hold the increase ‘well below 2 °C [ … ] and to pursue efforts to limit the temperature increase to 1.5 °C’. Moreover, and very importantly, Article 2 unravels or, more accurately, ‘enhances’ the objective of the UNFCCC (which was merely the ‘stabilization of greenhouse gas concentrations [ … ]’) by adding without limitation (as indicated by the term ‘including’) ‘the increasing ability to adapt to the adverse impacts of climate change’ (para (b)) and to ‘mak[e] finance flows consistent with a pathway towards low greenhouse gas emissions and climate resilient development’ (para (c)), which signals a shift in investment from ‘brown’ to ‘green’. Paragraph (2) of Article 2 places these goals in the light of equity and the principle of common but the differentiated responsibilities and respective capabilities (‘CBDR’). This principle was not present in the decision launching the Durban platform, but it has become unavoidable in climate change negotiations. Of note is the fact that the two other key principles of Article 3 of the UNFCCC (precaution and inter-generational equity) are not re-stated. Only the preamble of the Agreement refers back to the principles of the UNFCCC, but, again, it only singles out CBDR. It may be that climate change is no longer a matter of precaution but one of prevention – preventing an acknowledged risk. The diversity of goals is not merely exhortatory. It is taken up in the two other components of the Agreement, namely the obligations in each action area and the implementation techniques. In my subsequent post tomorrow (Part II), I will examine the three main action areas of the Paris Agreement and put forward several concluding observations. A really interesting read – thank you – wonder what you make of the global peaking “aim” (in article 4) and its link to the objective of keeping down the average temp. increase? Am guessing it’s an action you’ll be discussing tomorrow (so perhaps pick up then) but is it? It may not be in article 2 but it does seem an adjunct to an objective rather than an action per se. Much will depend upon one’s conceptualisation of an action under the Agreement, and what is legally obliged of States Parties? Thanks for your comment Duncan. The peaking is covered in the discussion of Article 4 that will appear tomorrow, but you’re right to point out that it could have been addressed as a goal. I guess the drafters preferred to see it as linked to mitigation action. One of the difficulties of the Paris Agreement is that it provides little systematic indication of its architecture. That is perhaps the main point of the post, to organise the different pieces into a reasonably coherent cartography that can be easily conveyed. Article 2.1 (which was referred to as “Purpose” until all article titles disappeared)primarily captures the link to the objective of the Convention. In this context it was important to include the temperature goals here, together with an indication of balance between the three main elements of the agreement (i.e. mitigation, adaptation and finance). The targets in article 4 (peaking, reducing and balancing or “GHG-neutrality”)are mitigation specific and needed to go there. One comment on article 2.2, Jorge, that did not seem to be captured by your post: This paragraph gives guidance on how the agreement will be implemented.It is important to note that such implementation will reflect CBDR-RC, in light of different national circumstances. By adding the “Lima-language”, the parameters for “reflecting CBDR-RC” have been broadened and allow for more nuanced and diversified differentiation between Parties. I can understand the agreement better with your explanation without no background in that agreement before.Thank you so much for sharing.